The history of the little-known 2″12-gauge is curious and colorful—with many ups and downs in more than a century, including its birth in Britain that was almost stillborn. Yet still it survives today, with a small-but-ardent following, especially in America with upland hunters. As a cartridge, the 2″ 12 predates the commercial introduction of guns chambered for it by more than three decades. Developed in the 1890s at the height of high-volume driven shooting, cartridges loaded to 2″ and 2¼” were marketed to shooters who wanted to carry more shells afield, though they were intended for guns with 2½”-or-longer chambers. Herein the problem: Poor obturation in the cartridges of the Victorian Age sometimes led to “balling” of the shot charge when stubby shells were fired through standard-length chambers, essentially fusing a swarm of pellets into a projectile with potentially dangerous downrange consequences. After a thorough trashing in the sporting press, the 2″ 12 cartridge’s future appeared dim. It wasn’t until around 1930—when lightweight, short-barreled guns were all the craze—that the 2″ 12 was born anew, this time reinvented as an ultralight load and as a featherweight gun made specifically to shoot it. Birmingham gunmaker Skimin & Wood is credited with completing the first commercially viable 2″ 12 in 1930—an A&D boxlock dubbed “The 20th Century Gun,” built to weigh 5 to 5¼ pounds and regulated to throw a ¾-ounce charge. Skimin & Wood touted “its lightness, regularity of pattern, high velocity and low recoil” and claimed (dubiously) that, owing to its cartridge’s absence of shotstring, its performance equaled or exceeded that of standard 2½” 12-bores. In an age that wished to disassociate itself with the past and one entranced by novelty, the fast-handling 20th Century Gun was something new and fresh, and it met with success. It wasn’t long before competitors were either building their own versions or, in many cases, selling Skimin & Wood-made guns badged with other names. J. & W. Tolley No. 84040 (pictured here) belongs to the Birmingham Gun Barrel Proof House museum collection and is a prime example of its type. It was no doubt built by Skimin & Wood, which in 1929 had acquired gunmaker Holloway & Naughton, which itself had taken over Tolley sometime around the First World War. Proofed in 1934, the Tolley was presented to Birmingham Proofmaster Lt. Col. Charles Playfair and, although it was re-proofed in 1984, it remains in almost-unused condition. Examples of 2″ 12s include Arrieta’s Wingshooter’s Light Game Gun and this J. & W. Tolley, which weighs a mere 5 pounds 2 ounces. As an unaltered example, the Tolley demonstrates how British gunmakers made 2″ guns much lighter than conventional 12-gauge boxlocks. With 26″ barrels and a 14¾” stock, it weighs a scant 5 pounds 2 ounces. Some of the weight reduction results from thin-walled barrels—which mike out at .024″ thickness left and right—as well as marginally thinner barrel lumps and thinner chamber walls at the breech. But another significant difference is the gun’s narrow action bar—the Tolley’s is 1-3⁄8″ wide compared to 1-9⁄16″ for, say, a standard Midland boxlock. Exactly why the Guardians (the governing board of the proof house) presented the gun to Lt. Col. Playfair is lost to current proof house staff. A recent search of Guardian archives by proof house historian Dave Evans turned up no references to it. It’s plausible that the presentation was related to a disputatious proof house decision around 1934-’35 to begin proofing 2″ guns at heavier 2½” pressure levels because of the sale of new metal-hull 2″ loads that were as powerful pressure-wise as 2½” shells. Absent written confirmation, however, the connection remains speculative. Two-inch 12s were never made in great numbers; one niche seems to have been with walk-up red-grouse shooters in Scotland and northern England. After the ’30s the guns fell from favor, though in the post-war period London makers, particularly E.J. Churchill and Holland & Holland, continued to build a few “best”-quality 2″ sidelocks. The inherent limitations of a light shot charge were part of the problem; thin barrels that could dent easily were another. Gunmaker Mark Crudgington of George Gibbs, Ltd., told me he has worked on or sold 21 two-inchers through the years and has found many to have wall thicknesses of .015″ to .018″, with one exhibiting .012″ walls measured off of original bore dimensions. The light actions of 2″ boxlocks also have proved prone to shooting loose, not surprising given the atrocious recoil modern British 2″ cartridges generate. America’s double-gun revival in the late 1980s helped rescue the 2″ 12 from oblivion. A number of fine-gun dealers—notably Woodcock Hill, British Game Guns and Wingshooting Adventures—began importing used examples from Britain, while writers such as Michael McIntosh, Douglas Tate and Charles Fergus praised the guns for their utility in the uplands. By the mid-’90s, 2″ 12s had an avid following, especially with grouse and woodcock hunters in the Northeast and Upper Midwest. Arrieta importer Jack Jansma of Wingshooting Adventures took growing interest one step further when he sent a 2″ Holland & Holland Centenary sidelock weighing 6 pounds to Spain for the Basque maker to replicate. The result was Arrieta’s Wingshooter’s Light Game Gun, a sidelock introduced in 1995. Built on 20-gauge (sometimes 16) frames, most of them weigh between 5 pounds 12 ounces and 6 pounds, depending on wood and barrel length. Two-inch purists argue that the Arrietas are too heavy by several ounces, with prevailing wisdom holding that a 2″ 12 should weigh “no more than 5½ pounds!” But they are gracefully proportioned, handle and carry beautifully, and are more suitable for sustained shooting than many of the older, thin-frame A&D boxlocks. (I speak from experience; I’ve owned both.) According to Lucas Urquijo, a director and partner at Arrieta, 82 2″ 12s had been made by the end of 2015, with 1998 having been the most popular year of production. Morris Baker, a 2″ 12 proselytizer and owner of Pennsylvania’s RST Classic Shotshell Company, has solved the problem of hard-kicking, hard-to-find English ammo imports by introducing a full line of American-made, roll-crimped, paper- and plastic-hulled 2″ shells. “The first thing I did when I bought RST was develop a range of shootable 2” loads,” Baker said. A newly introduced ¾-ounce load, which mimics the cartridge’s 1930s shot charge, is soft on the shoulder and develops only about 4,300 psi, said Baker, making it perfect for older British ultralights. I have found them a delight to shoot, and their availability bodes well for the future of the short-shell 12. Vic Venters is Shooting Sportsman’s Senior Editor. Now 13/8″ is larger than 19/16″ right? 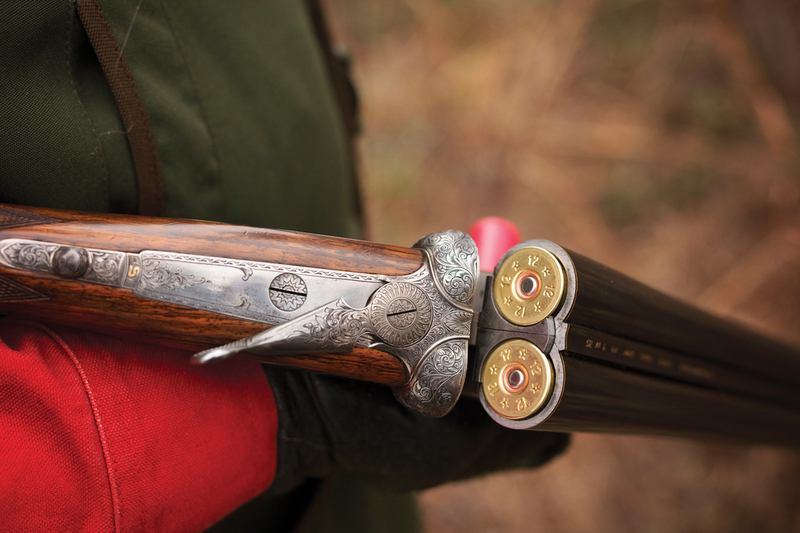 Our sixth-annual collection of shooting clothing and accessories celebrates the traditions of our sport.